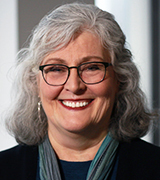 Dr. Patricia Franklin is a new member of IPHAM's Center for Patient-Centered Outcomes. She has joined the team at the Department of Medical Social Sciences as the co-Director of the Outcomes and Measurement Science Hub. Dr. Franklin was kind enough to answer a few questions so we can get to know her better. What is your research focus and how did you become interested in the topic? I am physician with health services research training and served as a medical director for quality in a large health system before focusing my career solely on research. Both my clinical and quality roles inform my commitment to improving health system quality and outcomes through innovation and research. I was frustrated that traditional quality metrics focus on adverse event rates and clinical complications. While these outcomes are important, I am dedicated to engaging patients with chronic conditions in defining quality and outcomes. Thus, my research focuses on the implementation, interpretation, and use of patient-reported outcomes (PROs) and patient-generated data in comparative effectiveness research and quality. For example, I am PI/Director of a P50 evaluating the long-term outcomes of total joint replacement (TJR) surgery in patients with advanced knee and hip arthritis, a cluster randomized trial of shared decision making for TJR using predictive analytics and PROs, and development of an app to self-manage knee arthritis. I am also collaborating in comparative effectiveness research on best DVT prophylaxis after TJR, optimal physical therapy after TJR, and impact of opioid use on TJR outcomes. Given this focus, I am excited to join Feinberg and the Departments of Medical Social Science and Orthopedics where I can translate PRO implementation lessons learned into research with other chronic conditions and health system initiatives to improve patient experience and outcomes. My research embeds translation into clinical systems. For example, the national cohort/registry of TJR outcomes is certified by CMS as a Qualified Clinical Data Registry so that all participating surgeons can secondarily submit our data to meet “quality” reporting mandates. Thus, we developed web-based, real-time dashboards for each participating surgeon and hospital to synthesize outcome data, including PROs, and compare their outcomes to national norms. As we conduct research on national outcomes, and conduct CER, we are creating a “learning health system” and providing value to the participating surgeons and healthcare systems. FORCE-TJR (our cohort) was highlighted recently in a National Academy of Medicine paper on learning health systems. Beyond clinician benefits, the results of my research bring value to the patients. We return individual symptom profiles to patients after they submit data to our studies. In this way, patients benefit immediately, as well as, we hope, benefiting from future lessons learned in our research analyses and publications. How can IPHAM researchers contact you to collaborate? I look forward to collaborating with IPHAM members. My contact information is below.